The CW has released the first official images from the next episode of The Flash today and they feature an intriguing glimpse of the future. In this episode, the Scarlet Speedster will travel forward in time in a bid to find out the identity of self-proclaimed “Speed God” Savitar. Whether or not he’ll succeed in that mission remains to be seen, but Barry Allen will come face to face with his future self and a variety of other characters. Those will seemingly include Mirror Master and Top, two villains also highlighted in the gallery of The Flash images above. Barry (Grant Gustin) travels to the future to find out Savitar’s still unknown identity in the hopes of saving Iris (Candice Patton). Upon his arrival in 2024, Barry encounters future versions of his Team Flash friends, who, following the death of Iris, have become very different people, profoundly impacted by their showdown with Savitar. It will be up to Barry to infuse a sense of hope back into the team, as he proves to be hero his future friends have been waiting for. Meanwhile, back in 2017, the hunt for Killer Frost (Danielle Panabaker) continues. Tom Cavanagh directed the episode written by Carina Adly MacKenzie. According to Grant Gustin, Barry has been left “in shambles” by the death of Iris West in this particular version of the future, so the adventure here will likely play an important role in how our version of the Flash goes about making sure her demise at the hands of Savitar doesn’t happen. 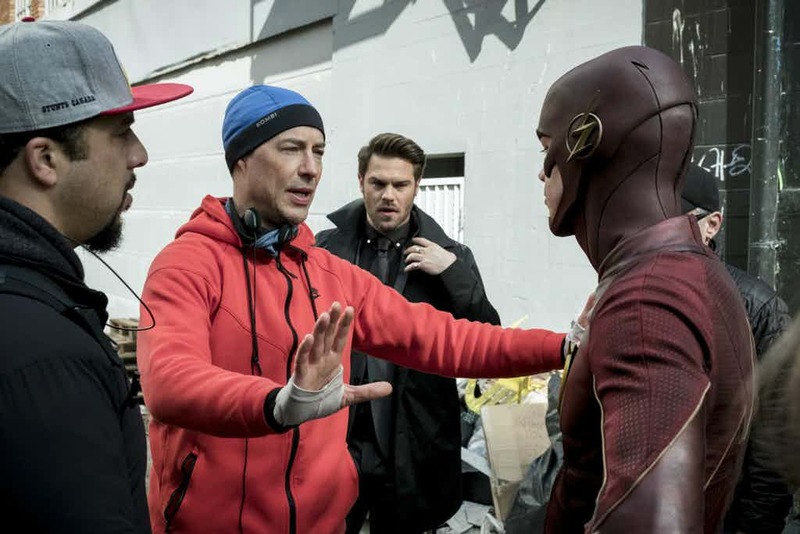 Something else you’ll likely notice in these photos is the fact that Tom Cavanagh is directing the action. This is a first for the actor, who has so far played Reverse-Flash and a fair few different versions of Harrison Wells, so it should be fun to see what he brings to the table while behind the camera. Tell us, what are you looking forward to with this episode of The Flash? Sound off below and let us know.